This entry was posted in Uncategorized on June 27, 2011 by admin. 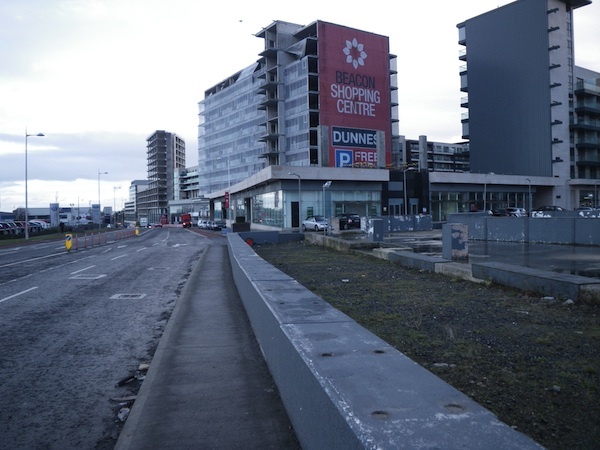 The dereliction that you highlight in Sandyford and Dundrum is unfortunately quite common and is likely to increase as economic contraction sets in over the next period a�� particularly in main streets with many shops closing. In the last 20 years Ireland has become cleaner, tidier and more colourful than before but there must be concerns that incomes and profits will decline leaving less available funding for maintenance. We need to take care to redirect our attention to these matters as planning applications decline. Other issues may be simply a�?house keepinga��. 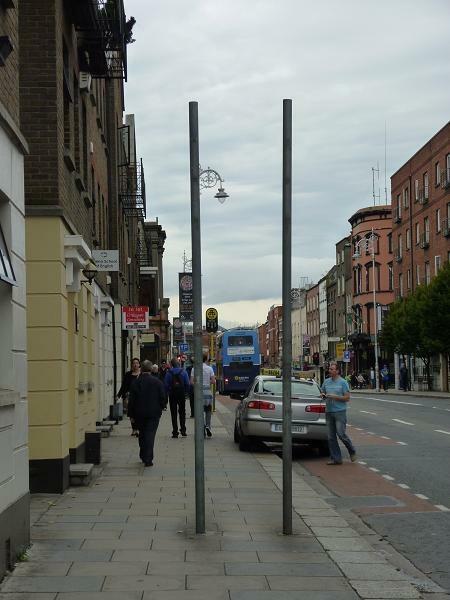 Kevin Duff who wrote the piece for An Taisce has recently made a interesting study of street clutter in Dublin that was posted on archiseek.com. OK, this isna��t quite dereliction but Duff has counted numerous poles, old and new, creating a visual mess that definitely damages the quality of the public realm. Some of the old poles have been there, empty of signage, for years. With good management control of local authority crews this could be resolved. As Margaret suggests in her blog, a good house keeper wouldna��t tolerate this in their home. Another critical aspect in how we perceive our urban environment is shopfronts. Just uploaded today onto the antaisce.org website is a submission from An Taisce in relation to unauthorised and non-compliant shopfronts, signage and landuse in Dublin 2. This well illustrated submission brings the problems into sharp focus. 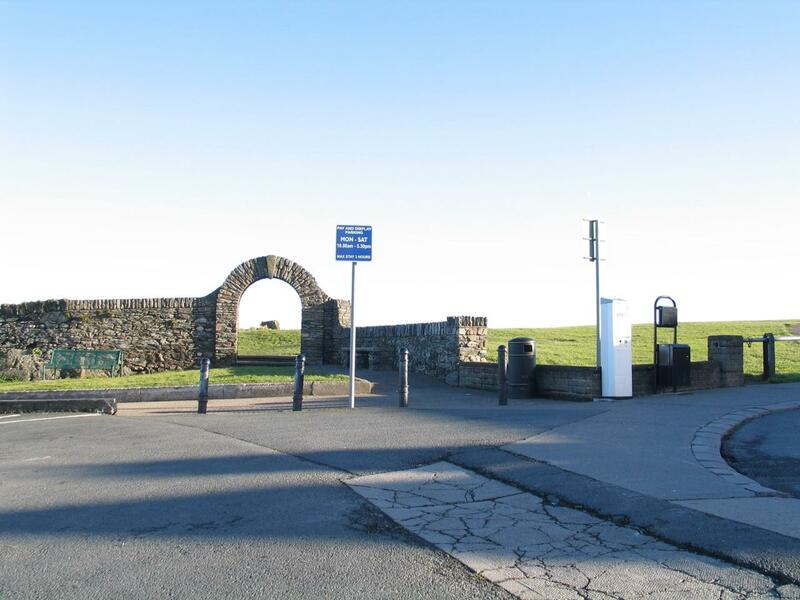 Look now at this picture of one of Wicklow Towna��s iconic views of the Norman arch in front of the 11th century Black Castle. 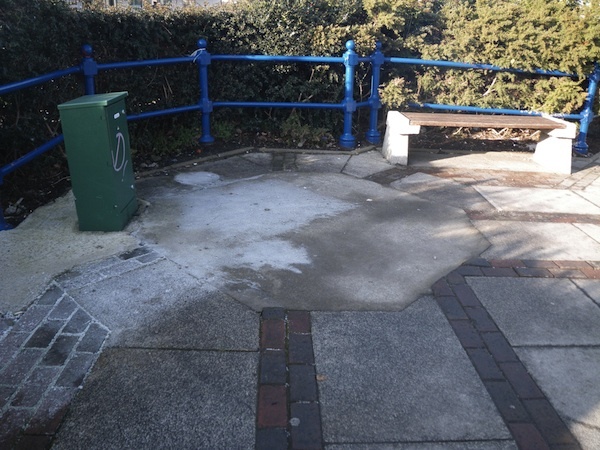 The parking restriction sign, the dog litter bin, the a�?keep your dog on a leada�� sign, the parking ticket machine and the general litter bin could all have been sited a few meters away in the car park. Why werena��t they? Who would accept responsibility for this? I have recently written to the town clerk about this. Wish me luck! There is also a problem with the maintenance of protected structures which are commonly left to rot a�� examples could be quoted where it has been established that this was clearly with the intention of ultimately obtaining permission for demolition and redevelopment as an easier option to increase profit from speculation. It is interesting to note that at an inquiry in an Oireachtas Committee in September 2009 the Department of the Environment officials were unable to say how many protected structures were in or near to a state of dilapidation. The website abandonedireland.com has some impressive photography of derelict manor houses. The local authorities have powers under the provisions of the Derelict Sites Act 1990 to intervene in these circumstances but rarely do so, maybe because nobody monitors the situation but local councilors could put pressure on their officials to take action. A derelict site is (broadly) defined as land which detracts from the amenity, character or appearance of land in the neighbourhood because the structures are either ruinous, unsightly or littered. A good example, or should that be a bad example, is the La Touche Hotel in Greystones. Planning permission was granted for a mixed development in 2005 but it never happened and the developer went bust. When the receiver reapplied for permission for a similarly over-dense development of minimum standard apartments (merely applying to change the use of the central protected structure from hotel to medical centre) An Bord Pleanala thankfully upheld an appeal from neighbours. The beautiful old hotel is now in a terrible state but nothing has been done about it. Indeed even litter is a general problem that the country still hasna��t quite got its head around. Despite valiant efforts by some Litter Wardens and Tidy Towns Committees etc. there is still a long way to go. Litter is still strewn along the roads around the countryside. Whose job is it to clear this I wonder? Youa��d think a litter picker could accompany roadside maintenance crews but it doesna��t seem to happen. Perhaps this is another example of poor management practice in local authorities but I would still like to see property owners be obliged to fulfill their duty to pick up along the boundaries of their land. This is covered in the Litter Acts. Lets look at the example cited by Margaret and what could be done to improve the situation in Sandyford. It seems to me that this could be a planning compliance issue. It seems unlikely that planning permission would have been granted for construction works to take over a public path or that the application would have included drawings to show this. In this case anyone can report unauthorised development under section 152 of the Planning Act. The local authority are obliged to issue a warning notice and, since the new Planning and Development Act 2010, shall issue an enforcement notice if planning permission cannot be established. (an unfortunate gap in the Act is that no time lines have been included for this!) I know I know. The councils are all very busy but following an EU case against Ireland (Infringement no. 2000/4384, Case C-215/06 ) the Department of the Environment have been drafting new guidelines for local authorities on how enforcement departments must be restructured to achieve better results. Therea��s no point having a shiny new Planning Act if we cannot enforce. And of course what if the developer has gone? Well, again, a new manual is being prepared a�� Unfinished Housing Developments Manual. It is designed to help with the resolution of unfinished housing estates but gives a helpful outline of measures that could be taken on other developments too including how to trace a run away developer. A draft of these can be seen on housing.ie and although the public consultation phase ended last month, the draft does highlight a number of actions that are currently available including those already mentioned, that is development controls under the Planning and Development Act 2000, the Derelict Sites Act and Litter Acts. The guidelines also discuss the calling in of bonds and securities a�� a big problem if, as commonly happened these were never collected in the first place! All in all I generally find that something CAN be done about all these issues if only we can be bothered! With much discussion on the smart economy, the recent talk given at Forfas (11 Nov 2010) on creative industries by Professor Dominic Power, Uppsala University is instructive. 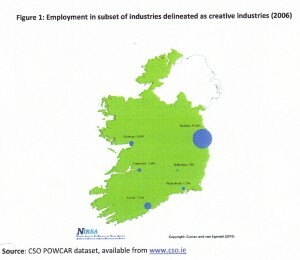 Power has been asked by the EC to survey creative industries in Europe and is regarded as an authority on the subject. We are not alone is seeking to foster creative industries. In fact it is a buzz word in many parts of Europe. He had some useful advice on supports for new creative industries, including affordable space, and a�?ice-breakera�� funds. There is a preponderance of creative industries in Dublin compared to the rest of Ireland, but it is notable that this is due to a large extent to media related industries. Manufacturing and crafts are more widely scattered. For more info see study by Declan Curran & Chris van Egeraat of NIRSA for Dublin City Council a�?Defining and valuing Dublina��s creative Industriesa��. This entry was posted in Uncategorized on December 14, 2010 by admin. At the height of the boom large projects were facilitated by allowing developers to take over parts of the public realm, footpaths etc. in order to maximise the available site area for construction. As sites are abandoned it seems to me that many of the a�?temporarya�� hoardings are staying in place – the public realm is reduced and past public investment is lost. 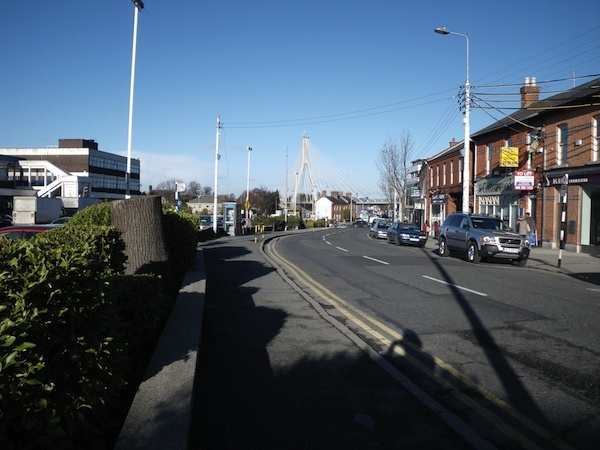 In Sandyford, the journey from the Luas stop to Beacon hospital is a typical example. 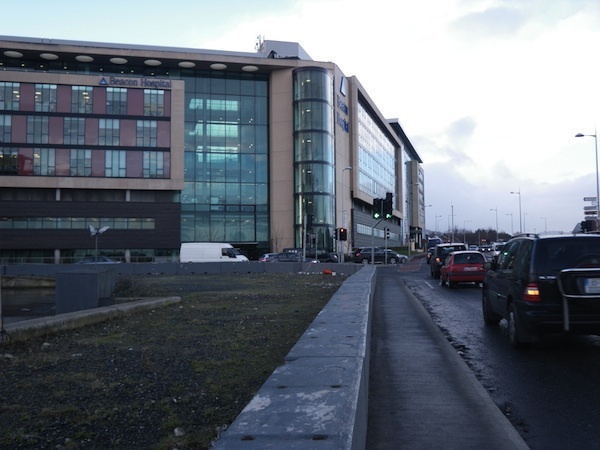 At the junction opposite the main hospital entrance, the site hoarding for the Beacon Quarter was placed outside the site, as is common practice. This required the removal of the cycle lane leaving a narrow temporary pavement, not properly drained, so that hospital workers, visitors and outpatients have to run the gauntlet of being drenched on wet days as they attempt to cross the road (this is a corner with several lanes of traffic queuing to feed into and out of the M50). When construction halted on the site, a new use was found as a car park (presumably temporary) to serve a shopping centre. 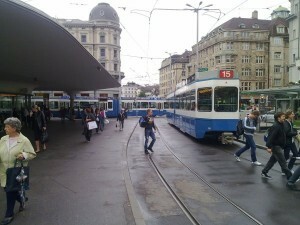 The hoarding was reduced in height, repainted with directional signage. 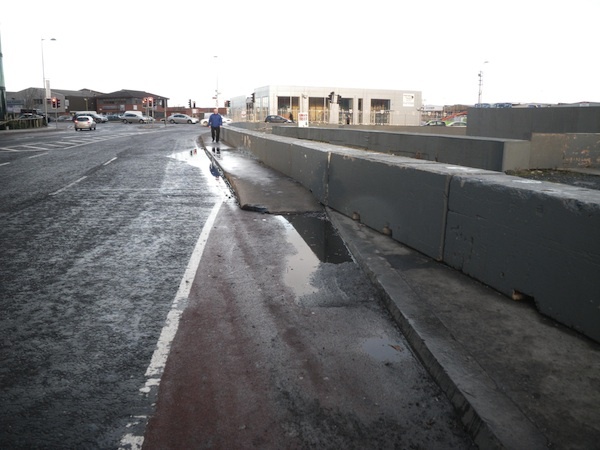 But astonishingly the hoarding was left in the same alignment and the cycle lane and pavement were not reinstated. So pedestrians and cyclists continue too suffer inconvenience and unsafe conditions with no improvement in sight. A more permanent loss of public realm is evident in Dundrum Village. The developera��s ambitions extended beyond the creation of a mega shopping centre beside the town. The older shopping centre on the Main St and a significant number of existing businesses and houses were bought up. 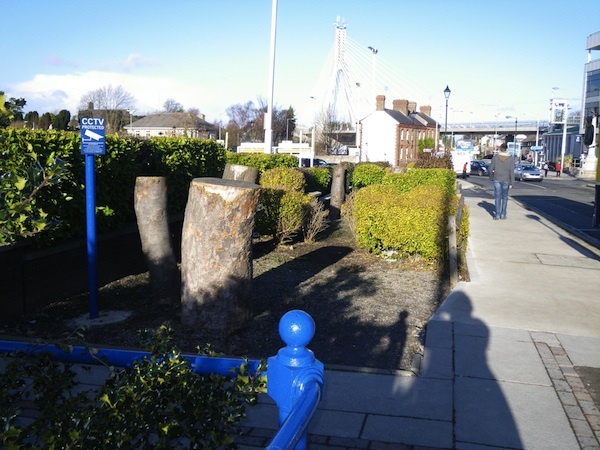 The 1st part of a�?site preparationa�� work involved cutting down all the streetside mature trees on the old shopping centre site, leaving a line of stumps. 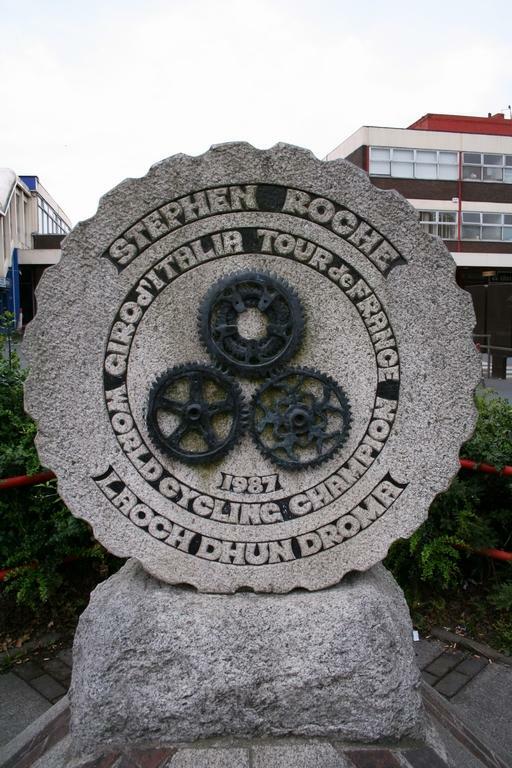 Also necessary for a�?site preparationa�� was the removal from the side of the public pavement of a bicycle wheel sculpture to Dundrum man Stephen Roche which had been proudly erected to commemorate his Tour de France triumph (this was relocated to an insignificant location in the new centre). The line of trees was an essential part of the streetscape providing visual amenity and enclosure a�� when the old shopping centre site was originally opened up and developed in the 70a��s this was understood and appreciated. Ironically the collapse in the market has meant that the old shopping centre is no longer closed down and is once again trading successfully, as are many other businesses in the town. However the visual amenity is blighted. Removal of trees for 'site clearance'. Loss of enclosure to Main street. Space where the monument was removed. Why does this sort of casual vandalism of the public realm happen? In my view what these examples highlight is a casual attitude to looking after the public realm/public goods. If it was our own private property there is no way it would be tolerated. A developer will almost always seek to assert the importance of their own site, to emphasise its individuality and to elbow out the a�?ordinarya�� public places. They may try to usurp or re-make the public realm as a part of the image for the new project, rather than accepting the existing and fitting into the context. Sometimes this can work for the betterment of the public realm, but often not. In my view Local Authorities around the country were too acquiescent in ceding public space to facilitate construction, and the system of licenses/exemptions for a�?site preparationa�� works, tree felling etc. is not sufficiently amenable to planning control. The current landscape of abandoned sites is a visual reminder of failure. There is a job to be done to stitch up and repair the gaps and interesting possibilities for temporary and pop-up uses until more permanent development is again viable. In the meantime it would be good to find ways to return the public realm to the public, and to find creative solutions to restoring visual amenity to our towns and villages. Margaret Coyle is an architect and planner and works in Dublin City Council’s Planning Department. The I.M.F. have arrived together with our E.C. colleagues and are pledging what Brian Cowen is calling a a��85 billion a�?overdrafta��. Our economic sovereignty is in question. Our nearest neighbour, Britain, is pledging a a��7.2 billion loan. The four year plan revealed today announces huge cuts in capital spending, increased taxes and cuts in social welfare. The budget in two weeks time will consolidate these austerity measures. Our Government will then resign. Incumbents will be replaced by incompetents. We have been accused of a�?tax piracya�� for our low rate of corporation tax that extends to multi-nationals. Our unemployment rate is at 13%. Our two main banks, AIB and Bank of Ireland are just short of being nationalised with a share value 1/100th of their value five years ago. The National Asset Management Agency will become the biggest toxic debt collector in the world. House prices have plummeted. Negative equity is everywhere. We have thousands of unoccupied houses throughout the country which are in neither sustainable nor desirable locations. There are several thousand more houses which are incomplete and decaying into dilapidation day by day. Other a�?ghosta�� estates have a minority of occupied houses, with occupants heavily mortgaged, and largely incomplete infrastructure. Resolving Ireland’s personal debt crisis “seems to be beyond the scope of human invention”, Central Bank Governor Patrick Honohan stated last week. Today Standard and Poora��s lowered our credit rating to A-1. We all want to know have we reached the bottom? Like the impatient child in the back of the car we keep asking, a�?are we there yet?, are we there yet?, are we there yet?….a�? Ita��s time to stop worrying and to start planning. We need a Plan where social, economic and spatial first principles are re-examined. The Spatial Planning Graduate Network is open to discuss and advance innovative ideas in the field of spatial planning. Let our advance worrying become advance thinking and planning. Out of intense complexities intense simplicities emerge. The recently published Dublin Mayoral Bill proposes a new framework for decision-making in relation to transport in Dublin and the National Transport Authority in particular. The Bill proposes to establish a Dublin Area Transport Council (DATC) which would replace the not-yet-formed Dublin Traffic Advisory Council. Unlike the latter body, which only has an advisory (i.e. non-decision-making) capacity, the DATC will have strong decision-making powers. Principally it will be responsible for approving the Transport Strategy for the Greater Dublin Area and Mid-east Region, with which all relevant Development Plans and Local Area Plans must comply. 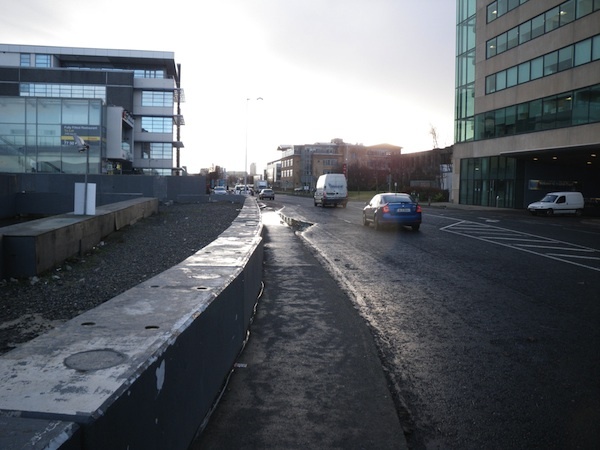 How will this body affect the quality and accountability of Dublina��s transport network? The NTA, finally established in December 2009, represents the incorporation of a long-awaited and much debated land-use and transportation planning body with legislatively-backed executive powers. Initially established as the Dublin Transport Authority, it is now a national agency responsible, more-or-less, for all transportation matters nationally. The origins of the NTAa��s powers lie in not one but a plethora of statutes, including the Dublin Transport Authority Act 2008 which established the body. 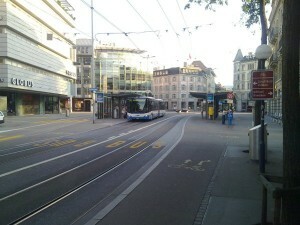 The Public Transport Regulation Act 2009 amended this Act to elevate the DTA to a national body, i.e. the NTA. Very oddly, it did this without amending its corporate structure or its principal functions. It therefore incorporated a Dublin-centric organisation with national responsibilities. For example, the NTAa��s principal function is to prepare a transport strategy not for the country, but for Dublin. It also has a specifically Dublin-based representation on its Board and Advisory Council. The Mayoral Bill also proposes to amend the DTA Act.A� And the DTA Act includes its own significant amendments to the Planning & Development Act 2000, principally that all land use plans MUST comply with the transport strategy.A� This means Development Plans, the primary source of all planning control in Ireland and the strongest contract between communities and their local government, will be hamstrung by what the NTA directs them to do. So, out of this tangle of legislation emerges an NTA with strong powers to license and coordinate services, control the distribution of subsidy to agencies and preside over the delivery of infrastructure. Reflecting primarily on the situation of Dublin, the NTA seems to be a significant step forward in terms of concentration and coordination of executive powers. Coupled with this, and the impending arrival of key end-user service features such as real-time-passenger-information on QBCs and integrated ticketing, Dublin appears on the threshold of having a much improved public transport network. But will this lead to a state of quality mobility that is socially accessible? 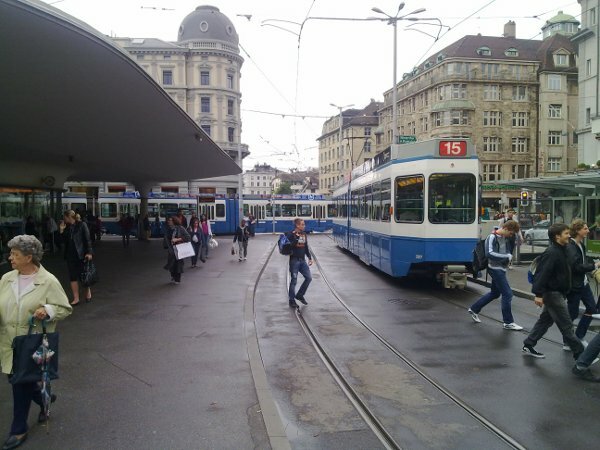 Experience from cities like ZA?rich, which boast an efficient and easy-to-use transport system, suggests that accountability is a key determinant in this regard. Even a cursory glance at most European local government systems, most especially the northern European and Nordic models, shows that such communities have a much greater say in the direction of their towns and cities.A� On a recent visit by Frank McDonald to Freiburg and commenting on the quality and sustainability of ita��s transport network, the Chief Planner for Freiburg said that a�?It comes from their citizenshipa�?, implying that the involvement and empowerment of the community led to decisions that best benefitted them and their city (The Irish Times – Tuesday, November 30, 2010). To that end the composition of the proposed DATC is both important and interesting. According to the current Bill it is to be a council of 12, made up of the Mayor, 5 mayoral appointees, 5 appointees of the Minister of Transport and the Cathoirleach of the Mid-east Regional Authority. This Council will take over the approval of the transport strategy for Dublin. This is a hugely important responsibility and will excerpt strong influence over the direction of the city and its future transport system.A� Under current standing this approval belongs to the Minister. This therefore represents some increase in accountability, i.e. one would assume that an elected mayor plus appointees would have some closer interest in the city region than a national minister. However, coupled with the fact that the minister has five appointees to the council AND retains vetoing rights under the Bill, any increase in accountability appears to be at best incremental and frankly contestable. 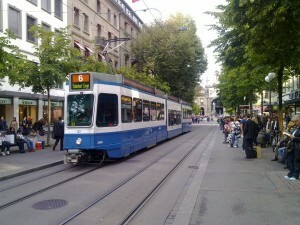 Bearing in mind that the transport strategy for Dublin must be complied with by every and any land use plan, including Development Plans a�� the principal source of all spatial planning a�� this has no little affect on the lives of citizens, the quality of environment and the well-being of the urban economy. Aside from accountability within Dublin transport, there are many issues raised by the new legislative framework. The potential effectiveness of the authority in the delivery of services and infrastructure, its ability to deliver and operate an integrated network and to effectively brand and explain the transport service to the community; these are all relevant questions in the early stages of its incorporation. However, fundamental to all of these is the accountability of the entity. In its current composition, the NTA is an appointed body which answers to a national minister. This is, to say the least, an unusual approach to city-level decision-making within a supposedly evolved democratic society. The proposals contained within the Mayoral Bill appear to address the existing lack of answerability in transport for Dublin but in reality stop far short of a properly democratic and accountable structure. It is surprising and disappointing that such a purportedly reforming piece of legislation does not go further in this regard. An elected mayor presiding over an elected regional council, perhaps nominated through a list-system, even with rotating community representatives, would be just one potential alternative. Making the Mayor (as opposed to the Dublin City Manager) a member of the Board would be another. Indeed, reverting to a proper DTA responsible for the capital-city region would be yet one more. But any such measures, or even a combination of them, would certainly improve the likelihood that Dublin be a user-friendly and accessible city for all her citizens. David O’Connor is lecturer in Transport Planning and Urban Design at the DIT School of Spatial Planning, Chair of the M.Sc. Spatial Planning programme and A�is Chairperson of the Spatial Planning Graduate Network.